I ordered this bike for my daughter's 10th Birthday. It was not in stock so they ordered it site to store. Site to store does assemble upon arrival of the item at no charge, you just have to ask. They only have assemblers to build the bikes in the store 1 day a week. The bike arrived on Wednesday and was assembled and ready for pick up on Monday. I was so impressed at the quality of this bike and how great it looks! After looking at several bikes, I was also very impressed by the low price since this has an aluminum frame which makes it much easier to maneuver and pick up. Most bikes I looked at were steel frame, and prices ranged anywhere from $149.99-$299.99.At $139.99 assembled free of charge, this bike is an amazing value! 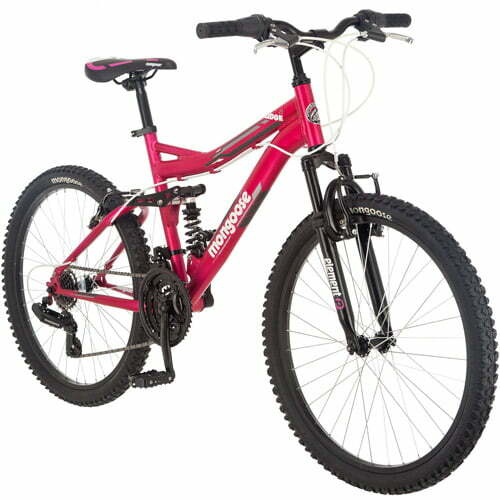 Tbook.com crawls the web to find the best prices and availability on Mountain Bikes and related Toys products like 24" Mongoose Ledge 2.1 Girls' Mountain Bike, Pink. For this page, related items include products we find that match the following keywords: "Mountain Bike" at our vendor partner Walmart. 24" Mongoose Ledge 2.1 Girls' Mountain Bike, Pink is one of 15 Mountain Bikes and related products listed in the Toys section of Tbook.com If you have any questions on this product, please give us a call at 734-971-1210 during the hours of 9am - 5pm EST for assistance. Thank you for shopping at Tbook.com, the Internet Department Store!